As we get older, it's not uncommon to suffer from problems such as corneal opacity and macular degeneration, which lead to cloudy or blurry vision. We all want our eyes to be as healthy as possible. Similasan Aging Eye Relief eye drops are specially designed to support corneal and macular health, and provide temporary relief for dryness which can occur as eyes age. Similasan eye drops are formulated with the natural botanical extracts Cineraria maritima to stimulate the body's natural ability to maintain a clear crystalline lens, and Herb-of-grace to temporarily relieve dryness, so you can get relief without harsh chemicals. Q: Do you still sell Cataract Care®? A: No we don't, but Aging Eye Relief contains the same ingredient, Cineraria maritima. Q: How often should I use these eye drops? 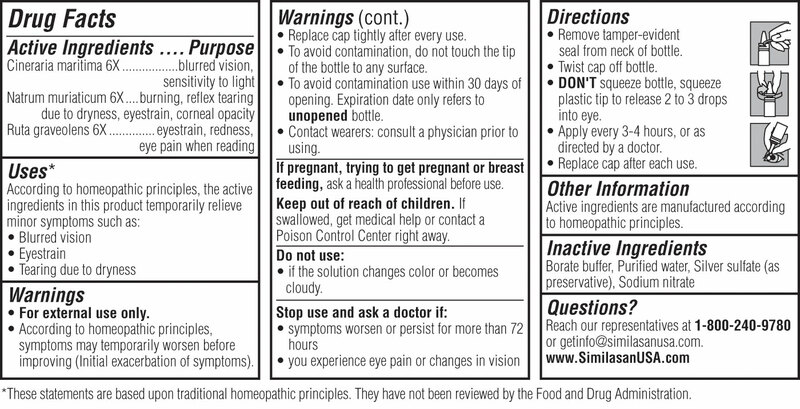 A: The recommended dose is 2-3 drops per eye, every 3-4 hours.